I know I had said that Hainanese Chicken would be the next stop on my Scrumptious Singapore journey, but I forgot that today is the Moon Festival! What day would be more fitting to share the popularity of mooncakes with you? Mooncakes are consumed once a year, during the Moon Festival (or Mid-Autum Festival, or as I recently learned – the Mooncake Festival. I like that last one best!). A harvest festival harkening back more than 3,000 years – supposedly on this night, the moon is at its fullest and roundest. And I am also at my fullest and roundest as I eat mooncakes to my heart’s content. 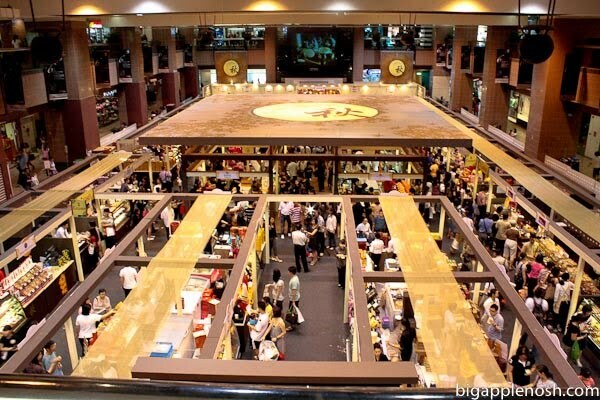 Yes, that is a pop-up mooncake market in a shopping mall, featuring more than 30 vendors selling all varieties of mooncake! Among the varieties I saw were sesame, custard, chocolate, durian (I passed on that one), chicken, mochi, red bean – and that was just the first few stalls. Additionally, mooncakes were sold in hotels, supermarkets, given away with certain meals or store purchases – the list went on and on. Even Haagen-Dazs sold ice cream mooncakes! My parents brought me back too mini mooncakes from Hong Kong (first picture) – green tea and sesame. I’ll be relishing them with gusto tonight! What variety would you like to try? 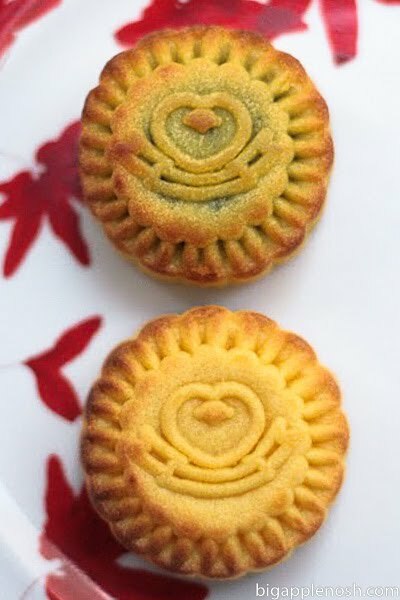 If you could suggest a mooncake flavor, what would it be? I totally forgot that today is the mid-autumn festival. Crap. Gotta figure out something to do to celebrate. My mom usually sends me mooncakes from LA, but she must not love me this year. Mmm. Sesame and mochi would be on my list to try. But I'm partial to the traditional salted egg. Whoever gets the biggest egg chunk is the luckiest! I want a Haagan-Dazs mooncake! Love the pop up moon cake market photo – so cool! @Try anything once Terri – Mango would be awesome! i'm all about the sweet bean paste–in korea our "mooncake" were plainer glutinous rice dumplings filled with either the sweetened sesame seeds or the bean paste. those mooncakes are so pretty! I forgot the festival was so soon! I am a bit sad because I have no idea where to get mooncakes here. I am like Lavenderpug I am partial to Korean mooncakes but I would love to try the Haagan-dazs ice cream ones! I want mochi. I think a pork one might be good. I'm so American, I totally don't even know what a mooncake is!! Ugh. But, I would love to try one. Mmm green tea flavor! Was that in Takashimaya? They have great food fairs! mmm. i love mooncakes, and the pop up stands look like a lot of fun to browse through! I'm not a fan of the yolk kind though, which is good cause yolks = more expensive! i'll be traditional and go with red bean or lotus, but winter melon might be interesting! or coconut? Your blog is too cute! Just discovered you through PFB, and just voted. 🙂 Love these mooncakes!